Blue Origin, the space venture founded by Amazon billionaire Jeff Bezos, has alerted the Federal Aviation Administration that it’s planning to put a brand-new New Shepard rocket ship through an uncrewed flight test at its West Texas spaceport this week. The FAA passed along word of the impending test in what’s known as a “Notice to Airmen,” or NOTAM. The notice alerts aviators to stay away from the testing ground, on Bezos’ ranchland north of Van Horn, Texas, between 6:30 a.m. and 1 p.m. PT daily starting Monday and ending Thursday. It’s an advance indication that Blue Origin’s first flight test in more than 14 months could be imminent, but there’s no guarantee that the launch will actually take place. Blue Origin representatives told GeekWire in an email today that they had no further details to add to the FAA notice. 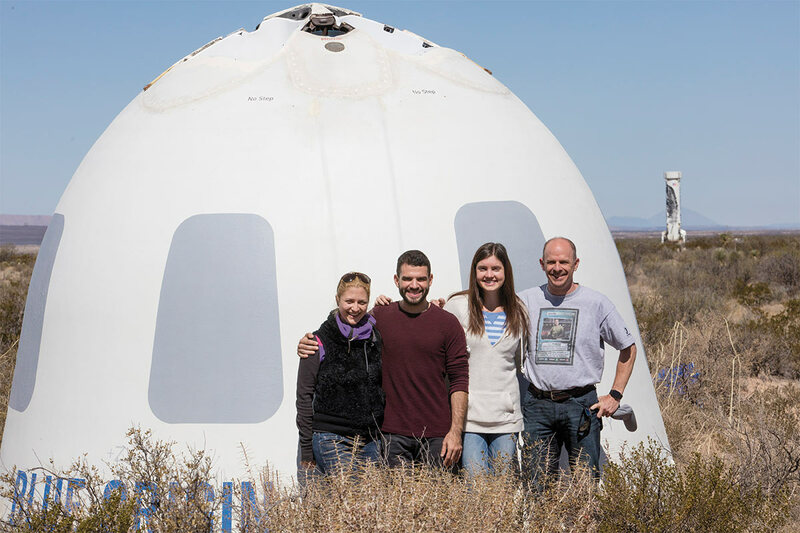 The most recent flight of Blue Origin’s New Shepard vehicle took place in October 2016, marking the craft’s fifth successful flight to space and back. Afterward, the propulsion module and the crew capsule were retired. Blue Origin’s team, headquartered in Kent, Wash., moved on to building a next-generation New Shepard for a new series of tests. The next-gen capsule is closer to the hardware that’s expected to take passengers to the edge of space as soon as next year. For example, it has actual windows, as opposed to the patches of paint that were put on the now-retired capsule. All of Blue Origin’s test launches to date have been uncrewed, but the more recent tests have carried suborbital science payloads. Last week, Blue Origin and Xerox’s PARC lab announced a partnership to accelerate research and development in space. The more recent tests also have been webcast, but for now there’s no word whether that will be the case for the next launch. Bezos has said he puts about $1 billion worth of Amazon stock sales toward Blue Origin every year. This year, the company’s workforce rose above 1,000 employees. In addition to the suborbital New Shepard program, Blue Origin is working on a next-generation BE-4 rocket engine and orbital-class New Glenn launch vehicle. It’s also laying the groundwork for beyond-Earth-orbit missions to the moon and other destinations. Blue Origin is due to start moving into its 750,000-square-foot orbital operations facility in Florida by the end of this year and prepare for the first New Glenn test flights by 2020. Although Bezos has said New Shepard could start taking on suborbital space passengers in Texas by the end of next year, the company hasn’t yet announced a ticket price, nor has it begun taking reservations. Hat tip to Space News’ Jeff Foust.